Our creative ingenuity promotes a construction process that will complete projects on time, within budget and provide you with quality service. We will provide the leadership that places your interests and needs at the very top of the spectrum at all times. Our first priority is your ultimate satisfaction. Schools, Banks, Churches, Medical Facilities, Detention Centers, Retail Centers, Office Buildings, and RESTAURANTS. G.A. Johnson Construction is proud to be a quality commercial builder. Do you have a company ready to expand to the Sioux Falls area, requiring more space, or needing an office updated? We have an experienced team to bring your business vision to life! Our knowledge of the Sioux Falls region will prove to be invaluable. As a leading custom home builder in South Dakota, we are a perfect fit for families moving to the Midwest. We are experts in building your dream home, but we don’t stop there! We also specialization in remodeling and home additions, increasing your home’s value and adding room for your expanding family. We lead the area in helping manufacturers, farmers and industrial plants with their precast, steel and wood framed building needs. We have the knowledge to expand or relocate your business. We have the team to update, add storage space, expand or build new. We are proud to be an authorized Chief Buildings dealer. Building a home is probably one of the most stressful yet exciting time of a persons’s life. The crew at GA Johnson worked with us as a team to deliver an exceptional, quality-built home. From the owners to the foreman and on site construction workers, they were professional, courteous and took pride in their work. Good communication was the key which made our project flow smoothly from start to finish. When “glitches” arose, they listened to us and made the necessary changes. We are extremely satisfied and love our new home! I have worked with G.A. Johnson on several county jail projects, going back to the 1980’s. I’ve always found them to be skilled at providing CM (construction management) services. They are team-players, understanding the role of the CM working with the architect and engineers to find the Best Value solution for the Owner. I’d recommend G.A. Johnson Construction to any county looking to find a solution to their jail needs. The Harrisburg School was very satisfied with G.A. Johnson Construction when they built our last elementary school. They were very easy to work with, often settling any change orders with no additional cost. They stayed within budget and ended the project ahead of our projected end date, allowing us ample time to move in. I would be happy to have them build any future projects I am involved with. I had G.A. 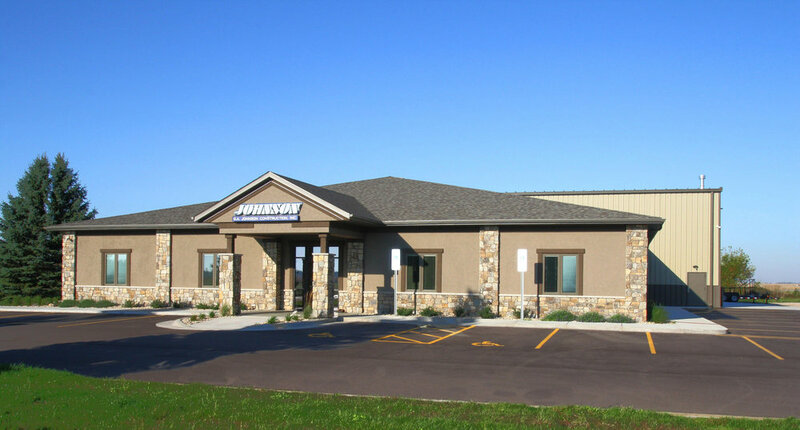 Johnson Construction build me a 120’×200’ with a 25’x80’ office on the side. You couldn't ask for better service. From design to constructing, they have great people with great ideas, and always had my interests in mind. Their construction manager was awesome, and I am sure saved me time and money. The building came in on budget and on time; I could have written the check before we started. Any building projects that we will have in the future will be done by G.A. Johnson without a doubt.